The Federal cabinet gave its go-ahead on Thursday to the government plan to form a new Pakistan Media Regulatory Authority (PMRA) bringing under it the existing media regulatory bodies. This, said Information Minister Fawad Chaudhry, is to be done by merging all the rules related to Pakistan Electronic Media Regulatory Authority (PEMRA), Press Council of Pakistan, and Pakistan Telecommunication Authority. Notably, PEMRA’s role is only to issue licenses for the broadcast media -television channels as well as FM radio- allot them frequencies, and regulate cable operators’ affairs. 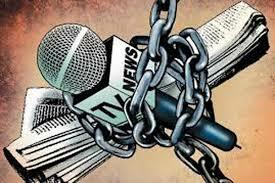 Its function is not to tell the media houses what they can or cannot put on the air. The real stakeholders are the Pakistan Broadcasters Association (PBA), Council of Pakistan News Papers Editors (CPNE), and All Pakistan Newspapers Society (APNS). The proposed authority is a blatant attempt to control media content rather than regulate anything. In fact, while briefing the Senate Standing Committee on Information, the minister revealed the real intent behind the move when he said the PTI-led government would ‘regulate’ all media and no one will be able to defame anyone. He should know that already there are defamation laws in this country to deal with the publication or broadcast, without proof, of defamatory matter. Besides, the media persons are subject to all laws of the land like any private citizen. Violators can be held to account under the present laws. Freedom of expression is a core democratic value which should be as important for an elected government to uphold as it is for the purveyors of news and views. Nonetheless, in a functioning democracy government and media have an adversarial relationship. As society’s watchdog, the latter have a responsibility to point out the rulers acts of omission and commission. The proposed regulatory authority, therefore, can only be seen as an effort to rein in those in the print and electronic media who refuse to fall in line. It is an attack on their hard won freedom, which must be resisted by all stakeholders. The bad faith is obvious also from the fact that although the government says the new authority is to be constituted in consultation with journalists, it is not paying heed to what the Press Council has had to say on the issue at its last month’s a general council meeting, which was attended by various representative bodies of the media as well as civil society groups. The meeting passed a unanimous resolution rejecting the proposed regulatory authority and advising the government to ensure freedom of the press. The ruling party seems to be relying on the divisions among the media bodies to bring them under control. It is about time they saw the threat for what it is and joined hands to protect and promote their common interest.